Background: Pregnancy in women with pregestational diabetes is associated with an increase in insulin requirements, however few studies have examined the differences between type 1 (T1DM) and type 2 diabetes (T2DM). Objective: To compare the pattern of insulin requirements in women with T1DM versus T2DM in pregnancy. Methods: This is a retrospective cohort study of 140 women with pregestational diabetes (T1DM; n=43, T2DM n=97) presenting for antenatal care between 2010–2012. Patient information was obtained from medical records. Insulin doses were recorded as total, basal and postprandial requirement at each review. Absolute units of insulin, dose corrected for weight (units/kg) and basal and postprandial dose as a percentage of the total daily dose were calculated and analysed using non-parametric tests. Results: There was no difference in insulin requirements (units, units/kg) between T1DM and T2DM beyond the 1st trimester, however women with T2DM required a greater proportion of insulin for postprandial glycaemic control (3rd Trimester; 66% IQR 52-73 vs 58% IQR 50-63, p=0.016) and a greater percentage rise after 24 weeks to delivery (142% IQR 116-189 vs 128% IQR 109-148, p=0.018). 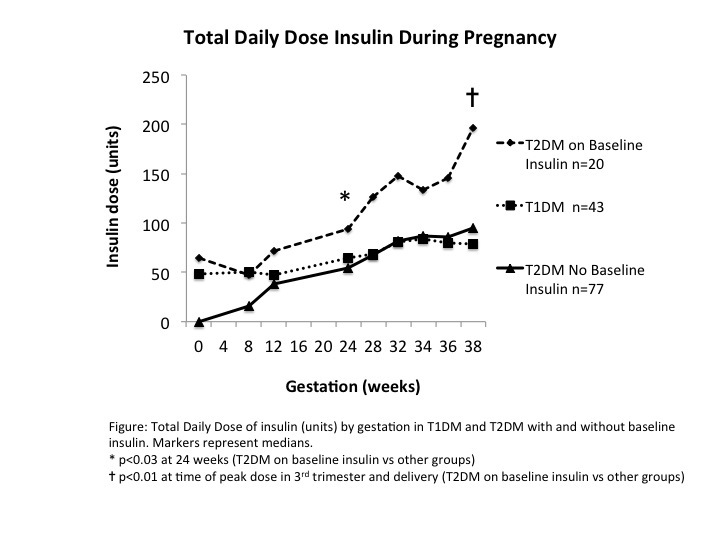 Since only 20.6% of women with T2DM were on insulin before pregnancy, this group was divided into those with and without baseline insulin (Figure). Women with T2DM and no insulin at baseline continued to have higher postprandial requirements compared to T1DM (3rd Trimester; 67% IQR 58 – 74 vs 58% IQR 50-63, p=0.003) while those on baseline insulin required similar proportions to T1DM. Women with T1DM had a higher risk of hypoglycaemia in each trimester despite maintaining a higher HbA1c. Conclusions: While women with pre gestational diabetes have similar insulin requirements (units, units/kg) in late pregnancy, the proportion needed to control postprandial hyperglycaemia varies amongst subgroups. This provides insight into those women who may have the greatest benefit from targeted dietary intervention.